André Leon Talley (born October 16, 1949) is an American fashion journalist, who is the former American editor-at-large of Vogue magazine. Talley has also served as international editor of the Russian fashion magazine Numéro. Talley was born on October 16, 1949, in Washington, D.C., as the son of Alma Ruth Davis and William C. Talley, a taxi driver. His parents left him with his grandmother, Binnie Francis Davis, who was a cleaning lady at Duke University, in Durham, North Carolina. Davis raised him and Talley claims he was given an "understanding of luxury." His grandfather was a sharecropper. Talley grew up in the Jim Crow era South, where the segregation was clear. He recalls: "for a long time my grandmother would not allow white people to come into our house. That was her rule. The only white man who ever came into the house was the coroner." His love for fashion was cultivated at an early age by his grandmother, Binnie, and his discovery of Vogue magazine, which he first found in the local library at the age of nine or 10. Talley was educated at Hillside High School, graduating in 1966, and North Carolina Central University, where he graduated with a Bachelor of Arts degree in French Literature in 1970. He was later granted a scholarship to Brown University, where he earned a Master of Arts degree in French Literature in 1972. At Brown, he wrote a thesis on Charles Baudelaire and initially planned to teach French. Beginning in 1974, he worked at Andy Warhol's Factory in New York City and at Warhol’s Interview magazine for $50 a week. That same year Talley volunteered for Diana Vreeland at the Metropolitan Museum of Art. He went on to work at Women’s Wear Daily and W, from 1975 through 1980. He also worked for The New York Times and other publications before finally landing at Vogue, where he worked as the Fashion News Director from 1983 to 1987 and then as Creative Director from 1988 to 1995. He pushed top designers to have more African-American models in their shows. He left Vogue and moved to Paris in 1995 to work for W, and served as contributing editor at Vogue. In 1998, he returned to Vogue as the editor-at-large until his departure in 2013 to pursue another editorial venture. From 2013 to 2014, he served as international editor of Numéro Russia, joining the team shortly after the magazine launched in March 2013 but resigned after 12 issues. He has been a member of the Board of Trustees of the Savannah College of Art and Design since 1995. In April 2017, Talley began hosting his own radio show focusing on fashion and pop culture on Radio Andy, a Sirius XM satellite station. Talley is the subject of a documentary film, The Gospel According to André, directed by Kate Novack, which was screened in September 2016 at the Toronto Film Festival and was released in the US in May 25, 2018. Reviewing the film, Variety magazine said: "The documentary is a deeply loving, frequently beautiful testament to the former Vogue editor, who rose from humble beginnings in North Carolina to become arguably the high fashion world’s first major African-American tastemaker, as well as the type of multi-lingual, Russian-lit-citing public intellectual who is perfectly at ease gossiping on TV with Wendy Williams." In the mid-2000s, an intervention was initiated by Anna Wintour to get Talley to lose weight. As seen on The Oprah Winfrey Show, he eventually lost a great deal of weight, and was eating more healthily. In 2007, he was ranked 45th in Out magazine's "50 Most Powerful Gay Men and Women in America". In 2008, Talley advised the future First Family on fashion, and introduced Michelle Obama to the Taiwanese Canadian designer Jason Wu, from whom she bought several dresses, including her inaugural gown. Talley's most famous pairings of late have been with designers Tracy Reese, Rachel Roy, and singer/actress Jennifer Hudson. He is known as a very close friend of pop diva Mariah Carey, fashion designer Kimora Lee Simmons, and tennis star Venus Williams. From March 2010 to December 2011, Talley served on the judging panel for America's Next Top Model (from Cycle 14 to Cycle 17). In October 2011, the André Leon Talley Gallery opened in the SCAD Museum of Art. Talley has been recognized for his important work. Talley fielding questions at New York book signing, June 10, 2013. Talley wrote an autobiography entitled A.L.T. : A Memoir, published by Villard in 2003. According to Publishers Weekly, the message delivered by the book is that "Style transcends race, class, and time." He also authored A.L.T. 365+, an art monograph designed by art director Sam Shahid, published in 2005. 365 features photos and captions from one year of Talley's life. Talley co-wrote with Richard Bernstein the book MegaStar, with an introduction by Paloma Picasso, which includes portraits of famous stars. ^ "André Leon Talley's Next Act". The New York Times. May 24, 2018. ^ WAMU: American University Radio (May 14, 2003). The Diane Rehm Show Archived September 27, 2007, at the Wayback Machine (html). WAMU 88.5 FM. Retrieved April 24, 2007. ^ Beatty, Paul (2008). Hokum: An anthology of African-American humor. New York: Bloomsbury. p. 257. ISBN 1596917164. Retrieved February 7, 2016. ^ a b Barker, Andrew (September 9, 2017), "Film Review: ‘The Gospel According to Andre’", Variety. ^ "The New Man of The People". NYpost.com. November 10, 2010. Retrieved November 19, 2015. ^ Talley, Andre (2003). Andre Leon Talley Biography. ^ a b Gross, Terry (May 31, 2018), "For 'Vogue' Titan André Leon Talley, Fashion Was A 'Gateway To The World'", Fresh Air, NPR. ^ Steigrad, Alexandra (March 13, 2014). "André Leon Talley to Exit Numéro Russia". WWD.com. ^ a b Brockes, Emma (May 6, 2018), ("Interview: 'Vogue was my escape hatch! '", The Guardian. ^ Boucher, Vincent (August 30, 2017). "Andre Leon Talley on the Influence of His Grandmother, Diana Vreeland in New Doc". The Hollywood Reporter. Retrieved November 30, 2017. ^ "The Gospel According to André". Rotten Tomatoes. Retrieved June 3, 2018. ^ "'Top Model' to get major makeover with Kimora Lee Simmons as new judge". Daily News. New York. November 12, 2009. ^ Dartis, Michelle, "Talley, André Leon (1949-)", BlackPast.org. ^ Talley, André Leon (April 8, 2003). A.L.T. A Memoir. Villard. p. 256. ISBN 0-375-50828-7. ^ Review of A.L.T. : A Memoir, Publishers Weekly, March 10, 2003. ^ Talley, André Leon (July 19, 2005). A.L.T. 365+. powerHouse Books. p. 240. ISBN 1-57687-240-8. ^ Bernstein, Richard; André Leon Talley (1984). Megastar. New York: Indigo Books. ISBN 978-0-394-62305-4. 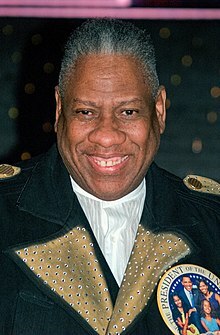 Wikimedia Commons has media related to André Leon Talley. Hilton Als, "The Only One", The New Yorker, November 7, 1994. Robin Givhan,"‘Race does define me,’ says André Leon Talley — and now the fashion icon is ready to talk about it", The Washington Post, June 8, 2018.